So who has been fortunate enough to receive a PWE from John over at Johnny's Trading Spot? Yeah, yeah - the page shows the names as "My First Blog", but I think John is just so busy with his PWEs that he doesn't have the time to get into the blog settings and update the header. That's the reason, right John? I'm not distracting you more, am I? Ooops. If you have been graced by an envelope from John, you have experienced his unique shipping style. Look close - that is a cut row from a 9 pocket page. John then stuffs 3 cards per slot, and sends one or two in a #10 envelope. DAMN - I wish I thought this up. Over the past few weeks, John has sent me a few envelopes of joy. I have two left to showcase - 2 sleeves per envelope - for a total of 36 cards. I am going to pick the best per slot, per row. So the best three cards in each sleeve. Then, as I am want to do (it's my blog - I set the rules), a little YouTube search to honor the best card of the three. It'll make sense when I start posting. Need me to distract them some more while you figure this out? No - that's okay future wife of mine. I can handle this. Alright, on with the scans. Since you see the same Big Hurt, this is the sleeve from the top of the page. An all ChiSox sleeve. I always like seeing Kenny Williams as a player. I forget that about him when he GMs. Good old Dave Martinez. Ya know - the last guy to wear 14 before a certain potential HOFer. Dave wins the sleeve and the tune. There's the #14 we know and love. 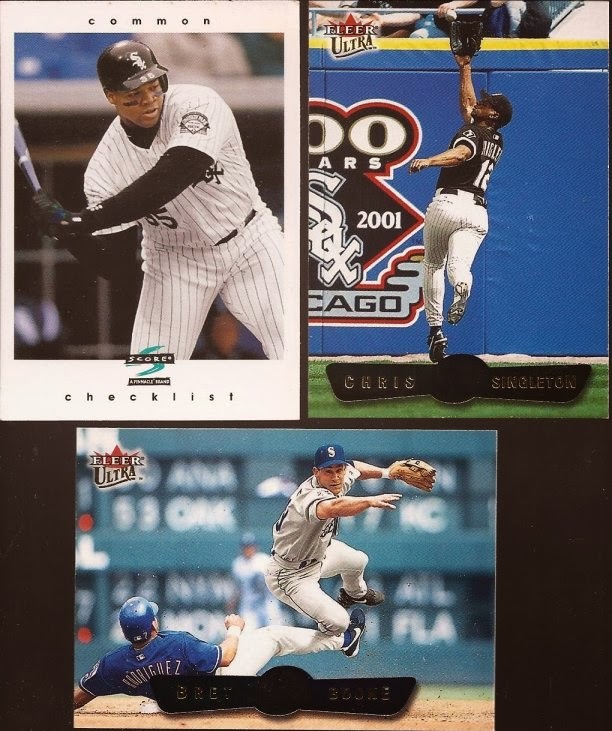 More ChiSox in this sleeve, and mostly at the plate. Love seeing Valdez and best card winner Lee watching their moonshots. Moving along to sleeve #3. Something really simple about a "common checklist". Seems like really out of place wording. Great double play card of Bret Boone. Ultra had some great images. Including best card winner of Singleton tracking a ball in center. You can see him just about to pull it in. And now, the final sleeve of twelve cards. I know many bemoan '92 Fleer, and I will agree the design stinks. But that is a perfectly framed picture of Alex. He had a good career ahead of him but good ol' arm trouble changed that path. Another needed DP, this time from Counsell. And the best of the bunch is Ray searching for a pop up in the sun. Nice picture, and a great dirty jersey. Thanks for playing and listening. And thank again to John for some great pieces of cardboard. Nice way to ship PWE. ON occasion I have received PWEs from sportlots that use a similar technique by using cut pockets from binder pages, but I haven't received one from John or his style of using 3 pockets. I think I once got three pockets folded inside a small bubble mailer. mr anderson, pull out a handful of braves for me and i will send you 1 of my pwes, then we can get trading on a very frequent basis. (dont worry i use bubble mailers and flat rate boxes too! that reminds jeff i have a box about ready to go for you too. jeff btw i want the first pic, rather the girl even if she's ur future wife, lol. joan jett's looking pretty hot there too. Was there baseball cards in this post? I missed 'em. Great post, solid cards but loved the pics at the beginning (dang she is hot) and really liked the Joan Jett version of Dirty Deeds. I am a huge AC DC fan and had never heard that version. After watching the video (agree with Mr. Miller that Joan is looking hot!) I went to iTunes and downloaded it. Thanks for turning me on to that song version!